When I was a little girl, neighbors and friends of the family used to bring me coins from their travels which I kept in a small wooden box. For no special reason, I still have the box. Over the years, my treasure grew from my own travels, and those of my friends, and in this occasional series I would like to share it with you. 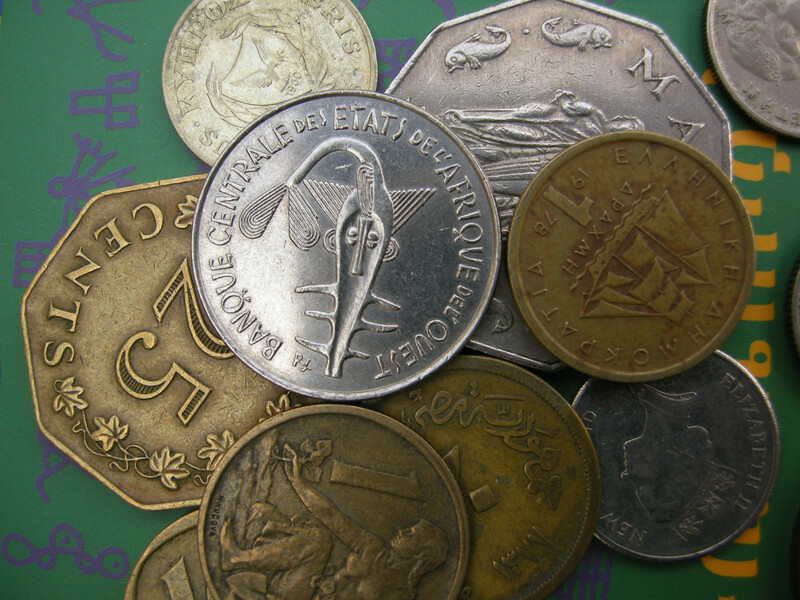 In the picture, we see a 100 franc coin from the CFA franc zone in Africa. This is the reverse with the name of the central bank, Banque Centrale des Etats de l’Afrique de l’Ouest, a strange figure in the middle and a mintmark. When the CFA was established in December 1945 the term originally stood for Colonies françaises d’Afrique (French colonies of Africa). In 1958, it changed to Communauté française d’Afrique (French Community of Africa) and today it is Communauté Financière Africaine (African Financial Community). – The eight countries of the West African Economic and Monetary Union (UEMOA) which are Benin, Burkina Faso, Côte d’Ivoire, Guinea-Bissau, Mali, Niger, Senegal and Togo. Their currency is the Communauté Financière en Afrique centrale franc BCEAO (Central Bank of West African States). 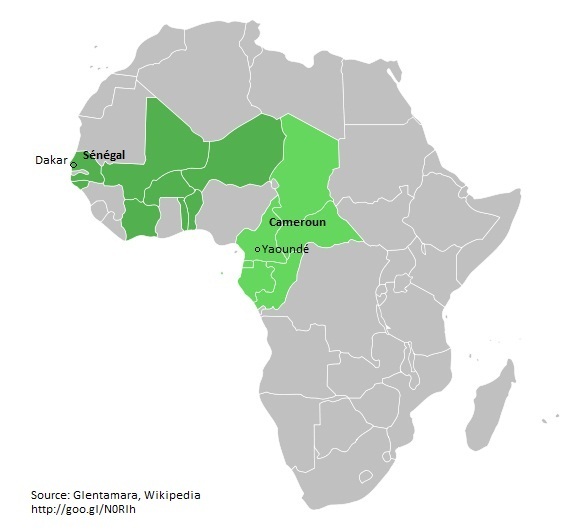 – The six countries of the Central African Economic and Monetary Community (CEMAC) with the Coopération financière en Afrique centrale franc BEAC (Central Bank of Central African States), Cameroon, Central African Republic, Chad, Republic of the Congo, Equatorial Guinea and Gabon. There is a West African CFA franc and a Central African CFA franc. Both are effectively interchangeable as both currently have the same fixed exchange rate to the euro. However, they are separate currencies and the West African CFA franc cannot be used in Central African countries and vice versa. The currency code for the Central African CFA Franc is “XAF”, for West African CFA it is “XOF”. Since January 1994, the value of the CFA franc is fixed to 0.01 French franc. Since the launch of the common currency in Europe in January 1999 it has been worth 0.00152449 euro. At this rate, the French Treasury guarantees unlimited liquidity in euro. Initially, the prospective shift of the peg of the CFA franc from the French franc to the euro had raised questions concerning the nature of the monetary relation between France and the African nations and the role of other EMU members. The general view was that while the Maastricht Treaty left some room for interpretation in this matter the free convertibility of CFA francs into euros by France must be regarded as a budgetary arrangement between the French Treasury and the central banks of the CFA franc zone and not as an exchange rate arrangement affecting all EMU countries. The coin in the picture, issued by the BCEA, was minted in 1976,in a period of growing economic cooperation. One year earlier, in 1975, the Economic Community of West African States (ECOWAS), a regional group of fifteen West African countries, had been founded in order to promote economic integration across the region. In Europe, this was the time of the “snake in the tunnel” as a first approach towards closer regional monetary cooperation: In 1972, some European countries had decided to limit the fluctuation margins of their currencies to 2.25% between member currencies and 4.5% against the US dollar. Only seven years later, in 1979, the European Monetary System (EMS) started with the establishment of the ECU. There have been discussions whether, similar to the European experience, the CFA franc zone could be a model for monetary coordination in other regions. However, member countries are extreme diverse, economic interdependence between them is low which is partly explained by the lack of infrastructure hindering trade, they are heavily indebted and highly dependent on exports of very different primary goods, foreign investment other than of companies exploiting natural resouces is of minor importance and there exist strong market imperfections. All this makes them improbable candidates of a model for others. Back to the coin: The figure on its reverse is a Taku, an old Ashanti gold weight. Until the end of the 19th century, gold was the currency of the Ashanti and other Akan peoples in the central and southern territories of modern Ghana. Gold dust was used in internal and external trade and merchants carried sets of little weights as measures (Arhin 1978). Those weights were artistic miniature sculptures made of copper, bronze or brass. They showed human figures in everyday life activities and sacred or courtly rituals, animals, but also abstract and ornamental designs. Some were very old. The first were mentioned in written literature in 1602. An interactive map and many informations about economic, monetary, political and commercial issues in all 14 member states of the CFA franc zone. Kwame Arhin: Gold-mining and trading among the Ashanti of Ghana, in: Journal des africanistes 1978, Volume 48, Nr. 48-1, pp 89-100. A short description of Ashanti gold weights can be found here. Many figurative gold weights represent proverbs. Examples can be found on this site of Akan Goldweights and Proverbs.